Yesterday Amy and I had a great day out exploring the Rhinogau. 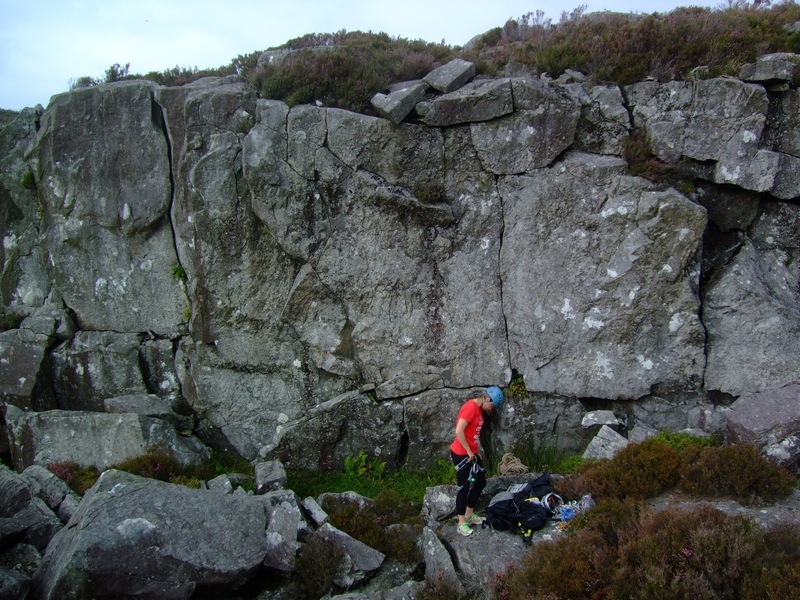 It's a fascinating place full of intriguing fine gritstone crags and rocky buttresses. 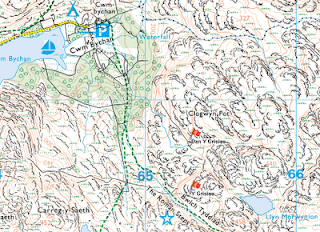 In terms of climbing it's a bit of a backwater; its lack of popularity is probably down to many things: lack of easy access, proximity to Llanberis and density of foliage. 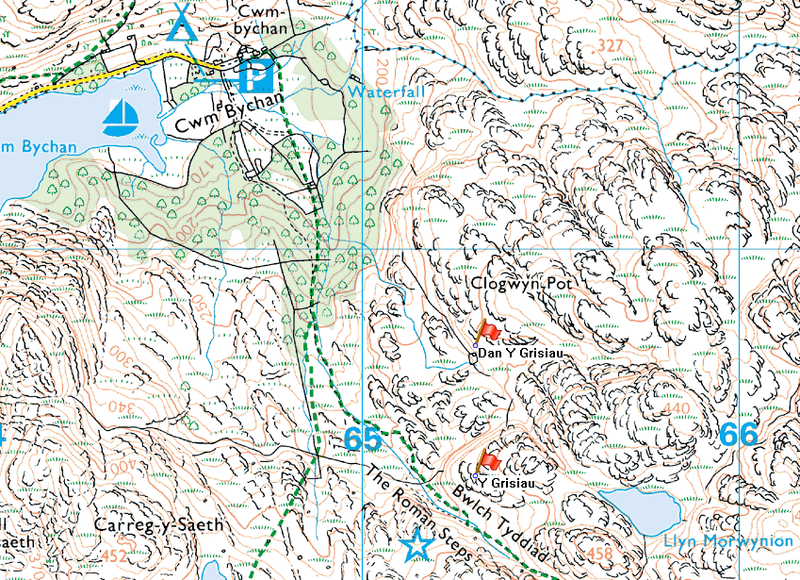 We approached from Cwm Bychan and first visited the crag Y Grisau (Meirionydd guidebook P.313). The crag is easily visible from the popular Roman Steps path. 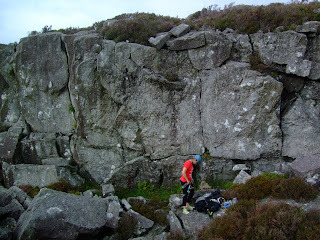 I climbed Wilderness Gritstone E3 6a, a very nice route. Hard bouldery few moves at the start followed by slightly bold climbing up to a finger crack which can be laced with gear ready for some awesome finishing moves. From Y Grisiau an interesting looking crag with a prominent lighting-bolt crack can be seen below and few 100m away to the NE, by the stream flowing from Llyn y Morwynion This crag isn't in the Meironydd Guidebook. I've called it Dan y Grisiau (meaning under the steps). A short battle through dense foliage saw us at the base. On closer inspection the lighting-bolt crack turned out to be at a disappointingly easy angle but still gave a fun scramble. To the right of the lighting-bolt crack there is a much thinner and steeper finger crack. This crack turned out to give a nice E2 6a, I've called it Banana Snap Crack. 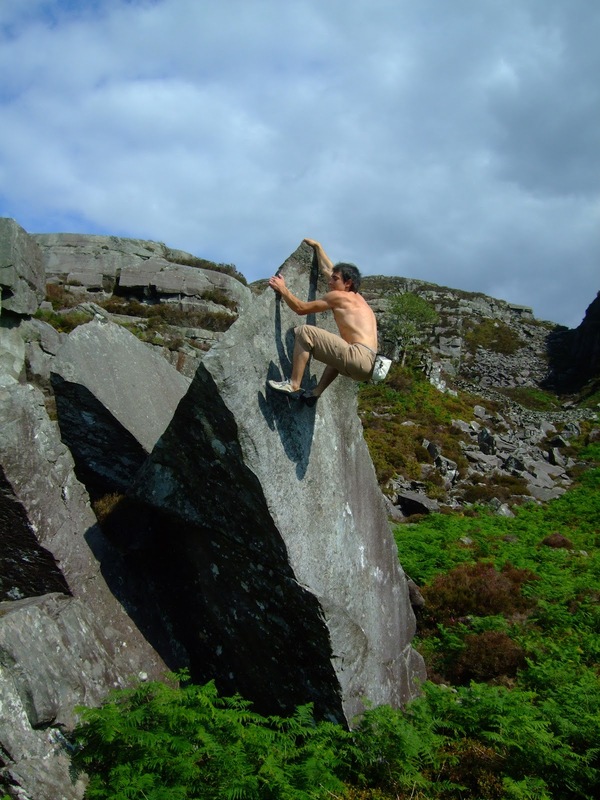 Banana Snap Crack E2 6a 10m * - Strenuous and rewarding climbing on pristine rock. Climb the splitter crack in the center of the buttress with the help of some holds out right. Swing right over 'the table' to finish. Before the midges hit hard we manged one more new route on a little crag 30m down stream from Dan y Grisuau. Hungry Monkey VS 5a 5m * - Short but enjoyable on fine rock. On small outcrop 30m downstream of Dan y Grisiau. Takes the obvious layback flake on the left hand side of the buttress. Belay well back taking care not to fall into the rock crevasse as the first ascensionist did. Another crag 30m down stream of Dan Y Grisiau.